Tico Torres The Drummer withAmerican rock band Bon Jovi Celebrates his birthday today 7th October. Originally from Sayreville, New Jersey. Bon Jovi Formed in 1983,and consist of lead singer and namesake Jon Bon Jovi (John Francis Bongiovi, Jr.), guitarist Richie Sambora, keyboardist David Bryan and drummer Tico Torres. The band’s lineup has remained mostly static during their history, the only exception being the departure of bass player Alec John Such in 1994, who was unofficially replaced by Hugh McDonald.The band achieved widespread recognition with their third album, Slippery When Wet, released in 1986. Their fourth album New Jersey, which was released in 1988, became just as successful as its predecessor. Bon Jovi went onto achieve thirteen U.S. Top 40 hits between 1986-1995, including four number-ones including You Give love a Bad Name“”, “Livin on a Prayer“, “Bad Medicine“, and “I’ll Be There for You”. Other hits include Keep the Faith ”Wanted Dead or Alive” ”Bed of Roses” Have a Nice Day and “Always”. Their 2000 single “, It’s My Life“, successfully introduced the band to a younger audience. Bon Jovi has been known to use different styles in their music, which has included country for their 2007 album Lost Highway which debuted at number one on the Billboard 200. Their latest album, The Circle was released in 2009, reaching number one as well.Throughout their career, the band have released eleven studio albums, three compilation albums and one live album, and have sold 130 million records worldwide. They have performed more than 2,700 concerts in over 50 countries for more than 35 million fans. Bon Jovi was inducted into the UK Music Hall of Fame in 2006. The band was also honored with the Award of Merit at the American Music Awards in 2004, and as songwriters and collaborators, Jon Bon Jovi and Richie Sambora inducted into Songwriters Hall of Fame in 2009. American author, poet, editor and literary critic Edgar Allan Poe sadly passed away on October 7, 1849. He is considered part of the American Romantic Movement and is best known for his tales of mystery and the macabre, Poe was one of the earliest American practitioners of the short story and is considered the inventor of the detective fiction genre. He is further credited with contributing to the emerging genre of science fiction.He was the first well-known American writer to try to earn a living through writing alone, resulting in a financially difficult life and career.He was born ; January 19, 1809 as Edgar Poe in Boston, Massachusetts; he was orphaned young when his mother died shortly after his father abandoned the family. Poe was taken in by John and Frances Allan, of Richmond, Virginia, but they never formally adopted him. He attended the University of Virginia for one semester but left due to lack of money. After enlisting in the Army and later failing as an officer’s cadet at West Point, Poe parted ways with the Allans. His publishing career began humbly, with an anonymous collection of poems, Tamerlane and Other Poems (1827), credited only to “a Bostonian”. Poe switched his focus to prose and spent the next several years working for literary journals and periodicals, becoming known for his own style of literary criticism. His work forced him to move among several cities, including Baltimore, Philadelphia, and New York City.In Baltimore in 1835, he married Virginia Clemm, his 13-year-old cousin. In January 1845 Poe published his poem, “The Raven”, which tells of a talking raven’s mysterious visit to a distraught lover, who is lamenting the loss of his love, Lenore and it traces the man’s slow descent into madness, which the raven seems to further instigate with its constant repetition of the word “Nevermore”. The poem has a supernatural atmosphere and also makes use of a number of folk and classical references and became a huge success.Poe claimed to have written the poem very logically and methodically, intending to create a poem that would appeal to both critical and popular tastes, as he explained in his 1846 follow-up essay “The Philosophy of Composition”. The poem was inspired in part by a talking raven in the novel Barnaby Rudge: A Tale of the Riots of ‘Eighty by Charles Dickens. Its publication made Poe widely popular in his lifetime, although it did not bring him much financial success. Soon reprinted, parodied, and illustrated, critical opinion is divided as to the poem’s status, but it nevertheless remains one of the most famous poems ever written.He began planning to produce his own journal, The Penn (later renamed The Stylus), though he sadly passed away On October 7, 1849, at age 40 in Baltimore; the cause of his death is unknown and has been variously attributed to alcohol, brain congestion, cholera, drugs, heart disease, rabies, suicide, tuberculosis, and other agents. Poe and his works influenced literature in the United States and around the world, as well as in specialized fields, such as cosmology and cryptography. Poe and his work appear throughout popular culture including literature, and music, . A number of his homes are dedicated museums today. The Mystery Writers of America present an annual award known as the Edgar Award for distinguished work in the mystery genre. The award is named after this author. There have also been many Gothic, macabre and chilling film and Television adaptations of his novels usually starring Vincent Price, Boris Karloff and Peter Lorre. I am a big fan of Poet Laureate Alfred, lord Tennyson, 1st Baron Tennyson, FRS who sadly passed away on 6 October 1892 at Aldworth, aged 83. He was buried at Westminster Abbey.Born 6 August 1809 in Somersby, Lincolnshire. He was Poet Laureate of the United Kingdom during much of Queen Victoria’s reign and remains one of the most popular poets in the English language. Tennyson excelled at penning short lyrics, such as “In the Valley of Cauteretz”, “Break, Break, Break”, “The Charge of the Light Brigade”, “Tears, Idle Tears” and “Crossing the Bar”. Much of his verse was based on classical mythological themes, such as Ulysses, although In Memoriam A.H.H. was written to commemorate his best friend Arthur Hallam, a fellow poet and fellow student at Trinity College, Cambridge, who was engaged to Tennyson’s sister, but died from a brain haemorrhage before they could marry. Tennyson also wrote some notable blank verse including Idylls of the King, “Ulysses,” and “Tithonus.” During his career, Tennyson attempted drama, but his plays enjoyed little success.He became Poet Laureate After Wordsworth’s death in 1850, and Samuel Rogers’ refusal, and was appointed to the position of Poet Laureate, which he held until his own death in 1892, by far the longest tenure of any laureate before or since. Queen Victoria was an ardent admirer of Tennyson’s work, and in 1884 created him Baron Tennyson, of Aldworth in the County of Sussex and of Freshwater in the Isle of Wight. Tennyson initially declined a baronetcy in 1865 and 1868 (when tendered by Disraeli), finally accepting a peerage in 1883 at Gladstone’s earnest solicitation. He took his seat in the House of Lords on 11 March 1884 and became the first person to be raised to a British Peerage for his writing. Thomas Edison also made sound recordings of Tennyson reading his own poetry, late in his life. They include recordings of The Charge of the Light Brigade, and excerpts from “The splendour falls” (from The Princess), “Come into the garden” (from Maud), “Ask me no more”, “Ode on the death of the Duke of Wellington”, “Charge of the Heavy Brigade”, and “Lancelot and Elaine”. Larry Walters (Better known as “Lawn Chair Larry”), sadly passed away 6th October 1993. Born 19th April 1949 he is best remembered as the American truck driver who took flight on July 2, 1982, in a homemade airship Dubbed Inspiration I, which consisted of an ordinary patio chair with 45 helium-filled weather balloons attached to it.Walters had always dreamed of flying, but was unable to become a pilot in the United States Air Force because of his poor eyesight. Walters had first thought of using weather balloons to fly at age 13 and 14, after seeing them hanging from the ceiling of a military surplus store. Twenty years later he decided to do so. His intention was to attach a few helium-filled weather balloons to his lawnchair, cut the anchor, and then float above his backyard at a height of about 30 feet (9.1 m) for several hours. He planned to use a pellet gun to burst balloons to float gently to the ground. So In mid-1982, Walters and his girlfriend, Carol Van Deusen, purchased 45 eight-foot weather balloons and obtained helium tanks from California Toy Time Balloons. They used a forged requisition from his employer, FilmFair Studios, saying the balloons were for a television commercial. Walters attached the balloons to his lawn chair, filled them with helium, put on a parachute, and strapped himself into the chair in the backyard He took his pellet gun, a CB radio, sandwiches, cold beer, and a camera.When his friends cut the cord that tied his lawn chair to his Jeep, Walters suddenly shot up to an altitude of over 15,000 feet At first, he did not dare shoot any balloons, fearing that he might unbalance the load and cause himself to spill out and slowly drifted from his point of origin in San Pedro, California, over Long Beach and crossed the primary approach corridor into controlled airspace near Los Angeles International Airport.After 45 minutes in the sky, he shot several balloons, and then accidentally dropped his pellet gun overboard. He descended slowly, until the balloons’ dangling cables got caught in a power line, causing a 20-minute blackout in a Long Beach neighborhood. Walters was able to climb to the ground, whereupon He was immediately arrested by waiting members of the Long Beach Police Department; when asked by a reporter why he had done it, Walters replied, “A man can’t just sit around.” Regional safety inspector Neal Savoy was reported to have said, “We know he broke some part of the Federal Aviation Act, and as soon as we decide which part it is, some type of charge will be filed. If he had a pilot’s license, we’d suspend that. But he doesn’t.” Walters received the top prize from the Bonehead Club of Dallas for his adventure, and also gets an honourable mention on the Darwin Awards website His flight was also widely reported in many newspapers. GWR 4930 HAGLEY HALL was built at Swindon Works by the Great Western Railway in 1929 and was acquired by the Severn Valley Railway from Dai Woodham’s scrapyard on Barry Island in 1972.After a period of restoration the locomotive entered service on the line in 1979. 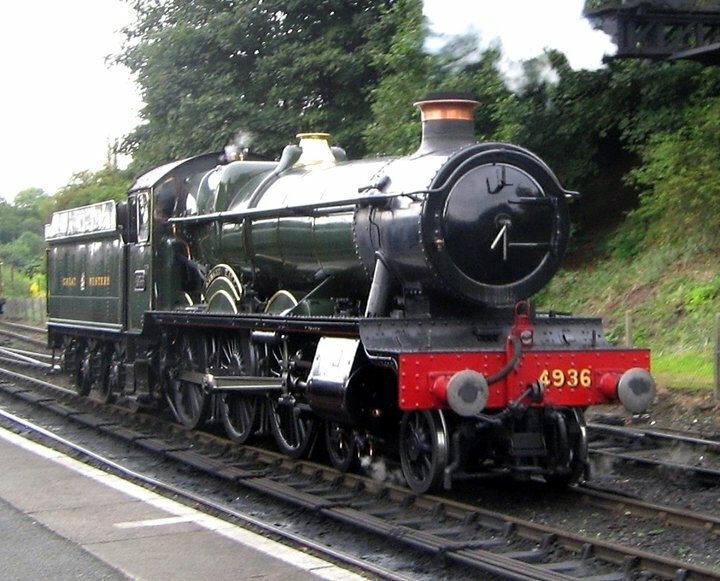 It hauled trains along the Severn Valley until 1986 when it was withdrawn from service as the boiler certificate had expired. 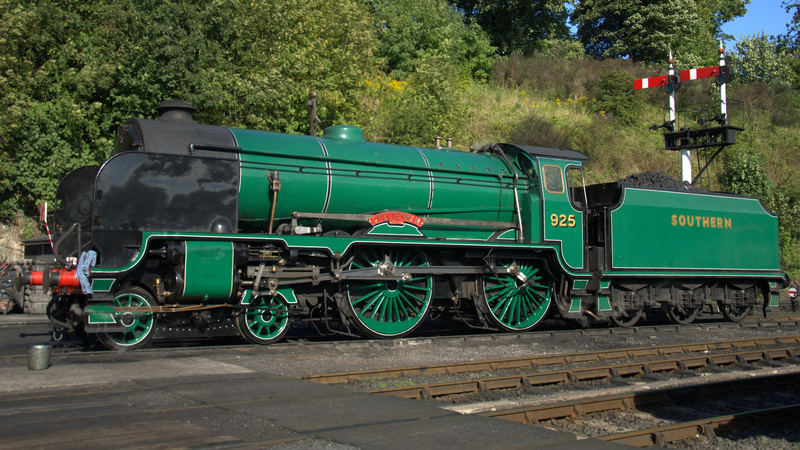 After a long period under tarpaulins, Hagley Hall was cosmetically restored and moved for static display at the MacArthur Glen Shopping Centre at Swindon.With the opening of our Visitor Centre in 2008, Hagley Hall returned to the SVR and has been on display at The Engine House ever since. The departure of Hagley Hall has allowed staff at the Engine House to reorganise the exhibits and LMS Black 5 4-6-0 No. 45110, is now on display following its return from Barrow Hill, and the next trains running on the Severn Valley Railway will be visiting engines 925 Cheltenham and GWR 4936 Kinlet Hall on the 12 & 13 October.